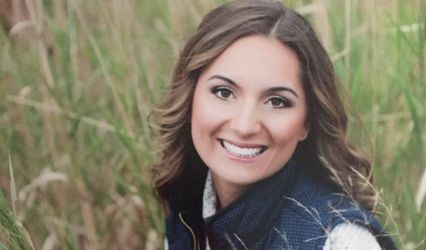 Elegant, classic, yet completely contemporary, Sorella personalized jewelry captures the joy of life's special occasions - for you and those you care for. Sorella makes it easy to design spectacular, personalized jewelry you can give or wear with pride. One of the happiest days in a couple's life, a wedding is truly cause for celebration. There's no more beautiful way to capture the joy than with a unique piece of jewelry created just for the occasion. Sorella Wedding Jewelry is made and personalized to your specific wishes. 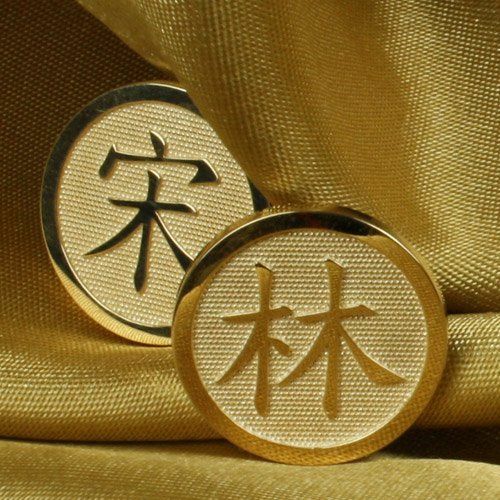 Whether it's a ring or pendant that holds the couple's names, the wedding date, a few words from the vows, a special saying or a combination of these, each one-of-a-kind personalized piece makes lasting memories for a one-of-a-kind couple. We'll create it for you in Platinum, Palladium, Gold (10k, 14k or 18k), or Sterling Silver or combine metals, for an amazing two-tone look. We also create completely custom designs to match your special vision. All pieces are made-to-order in our Michigan studio and sold online across the US and internationally. 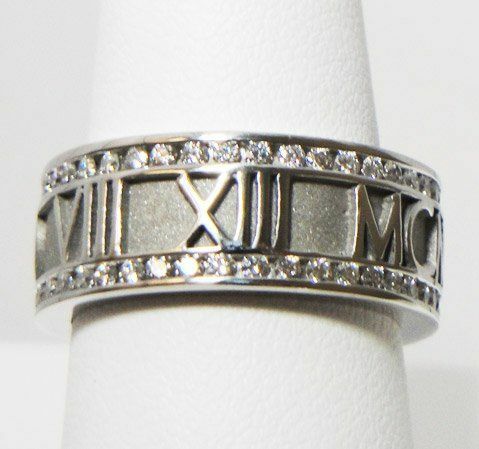 Personalized Roman Numeral Band with Pebbled Background in Palladium. 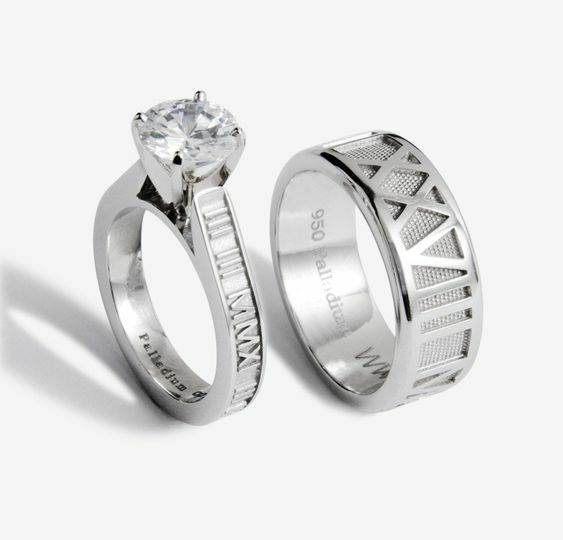 His & Her Matching Personalized Roman Numeral Bands in Palladium. 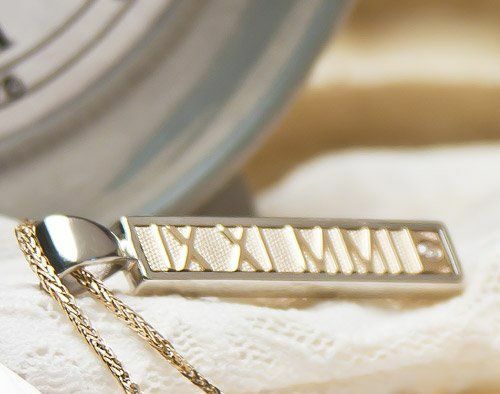 Personalized Vertical Roman Numeral Pendant with Diamond in Two Tone Gold. 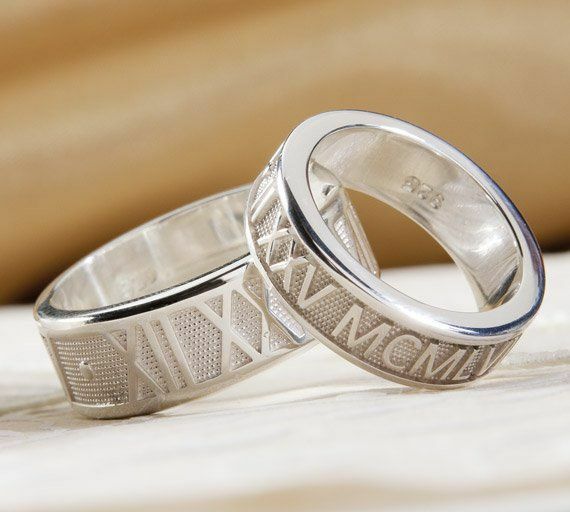 Diamond-Rimmed Personalized Roman Numeral Band in Palladium. Two Tone Gold Personalized Roman Numeral Band. 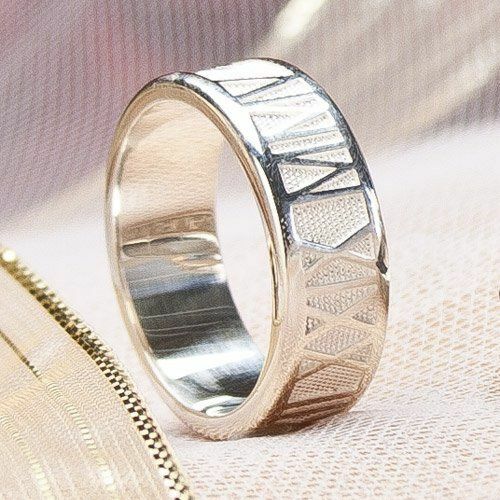 Personalized Roman Numeral Band with Cathedral-Set Pearl in Palladium. 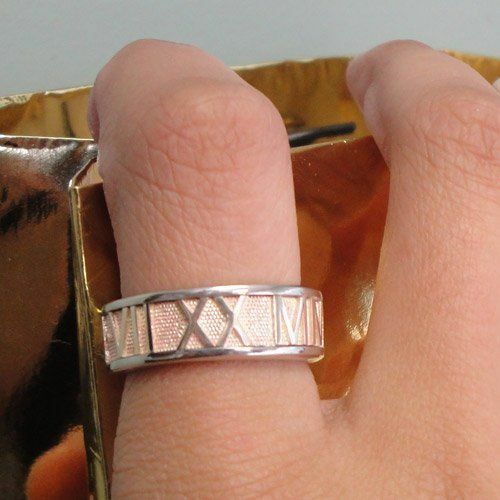 Personalized Roman Numeral Band in Two Two Palladium and Rose Gold. 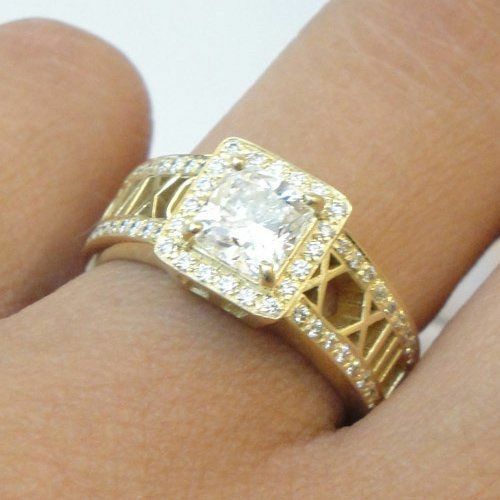 Custom diamond band with a rope motif border and pear cut 2ct diamond in 14k Yellow Gold. The little box wrapped so beautifully and waiting under the tree was for me! My boyfriend of 3 years asked me to marry him in front of my family on Christmas morning. He had worked with the women at Sorella to design a ring just for me. I LOVE it! 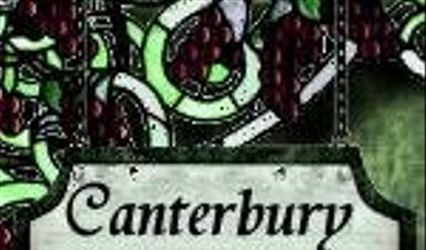 Beautiful, good quality, and he said they were great to work with. We could not be happier with our rings and the service we received from Jeanne, Lynn and their staff at Sorella. 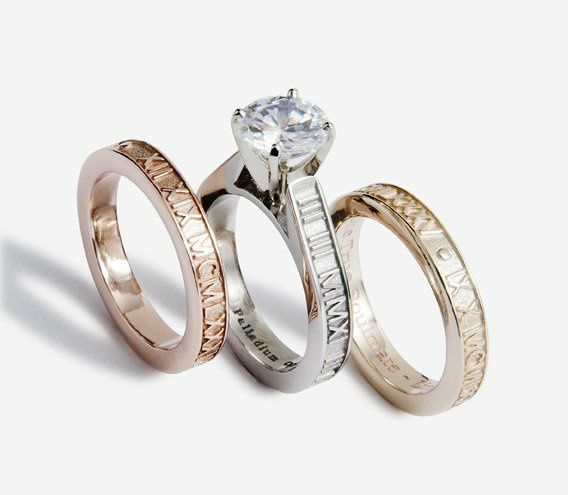 It's scary buying something as important and personal as a specially designed wedding ring online. You never really know how it will turn out. Well, it was awesome. They paid such close attention to detail and to what we wanted. The rings are beautiful and so well crafted. They kept in constant touch and kept all their promises. We are happy happy happy. I just received my custom wedding ring in the mail today, and I had to come and comment immediately. I have been looking around for a jeweler that would make a specific ring for me, and I was either turned down - or asked to pay an arm and a leg. When Sorella messaged me back saying that they could make the piece and gave me a reasonable price.. I was a little skeptic.